If you're trying give a little differently this holiday season, these ideas might work for you! 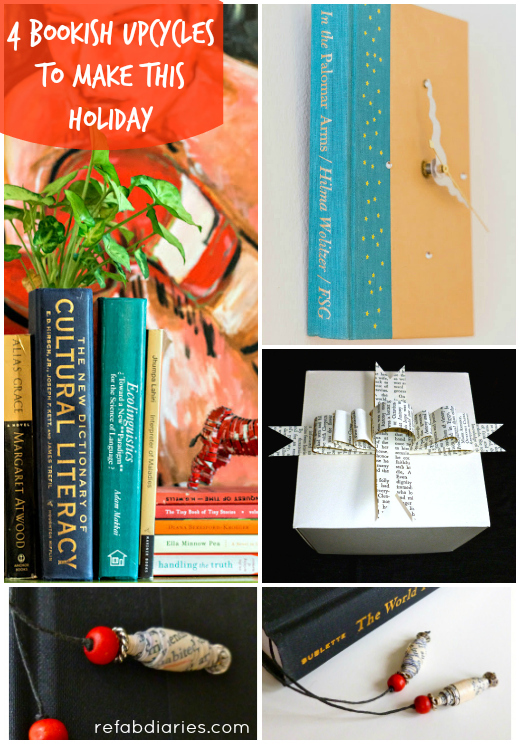 They're easy DIYs, don't cost that much (time or money) and make meaningful, unique gifts for book lovers. Or friends who know that you're a book lover! 1. A book planter. It can also be used as a vase and is much easier to make than you'd think. This is a great way to repurpose an outdated reference book. 2. A book clock. This is an elegant way to re-use a book with a beautiful hardback cover (and junky content). I'm always drawn to unusual colors and quirky titles. 3. Dress up gifts with bows made from book or magazine pages. 4. Or use book pages to roll your own beads and make simple bookmarks.